Are you ready to beat your friends in the ultimate brain puzzle?! Swipe with your finger, connect letters and find and create hidden words. It starts off easy but will soon become challenging! Use your noggin to master every mind challenge in this fun spelling brain game. This word game begins with a 2x2 grid but quickly escalates to a grid of 8x8 for toughest word game challengers. You begin as Word novice to beat more than 650 levels and become a true Word Alchemist! Play this awesome word game with your friends by connecting to Facebook and ranking on the leaderboards! Are your friends up for the challenge? 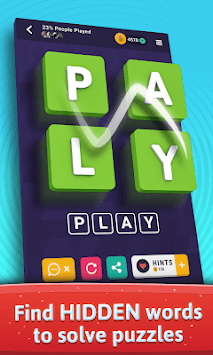 ➜ Connect the letters by swiping over them horizontally, vertically, diagonally, forwards or backwards to form a word. ➜ Find all the hidden words to complete a puzzle. ➜ The real brain challenge is finding the CORRECT word. There may be easy words to come to mind first, but it might not be the word needed to complete the challenge. 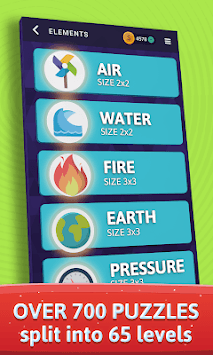 ➜ Unlock an element each time you complete a level. Create the whole universe from the basic elements. ➜ Feel stuck at some point? Use Gold and take a hint. Remember there are no unsolvable puzzles. All these word puzzles are double-checked to be sure they can be solved. ➜ Find words in the correctly listed order. If you do not, you might not be able to connect letters for the second word. ★ More than 800 puzzles! ★ Improves vocabulary and spelling skills. ★ Feel achievement with increased leaves of the word tree. ★ Play OFFLINE in anytime and anywhere. ★ Its FREE and all future updates are also free! 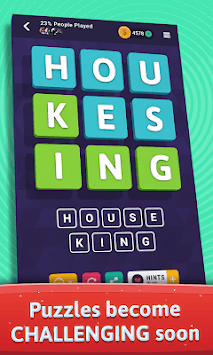 Come have fun with this challenging and addictive word search puzzle game. We bet you can't put the phone down once you begin playing! Word Alchemy is made with love by the makers of word games like Wordathon: Boggle you Mind, Word Search, Word Search Twist and Hangman. World's #1 HIT Word Brain game! The MOST addictive word game EVER! A great game for language lovers!